The main chamber. 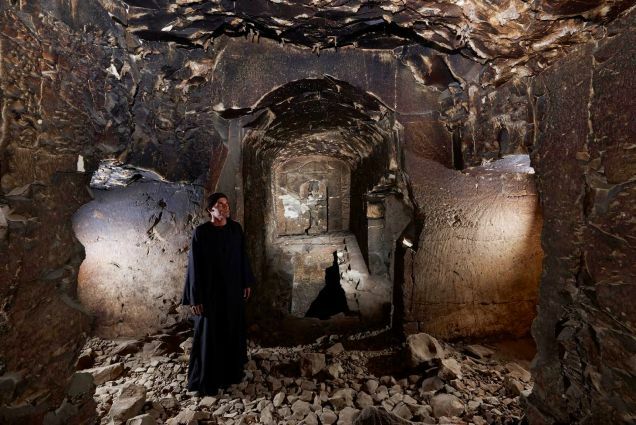 You can see the statue of Osiris at the back, with the stairs and central shaft going down. Every culture has its legends and its myths. Most of us are familiar with the legend of King Arthur, the greatest king in British legends, and his queen Guinevere. Likewise, the mythology surrounding Osiris is one of the most prominent tales to come out of Egypt. Osiris is the ancient Egyptian god of the dead and the ruler of the underworld. As is true of many religions, the myths surrounding this figure are complex and varied. He was the god of immortality; he was supposed to judge the dead, only allowing the morally worth into his afterlife; he was seen as a god of regeneration and rebirth, and he held a number of other roles that varied according to the cult. But regardless of how he was seen, he was widely regarded as one of the more powerful Gods. And now, archaeologists have discovered an ancient tomb that appears to be directly modeled according to the mythical Tomb of Osiris. This find was made by a Spanish-Italian archaeological team, in cooperation with the Egyptian Ministry of Antiquities. This tomb was described by Egyptian lore in the necropolis of Sheikh Abd el-Qurna, a funerary complex that is part of the Deir el-Bahari (the Northern Monastery) that is located on the West Bank at Thebes. The tomb was initially uncovered back in 1887 by Philippe Virey. 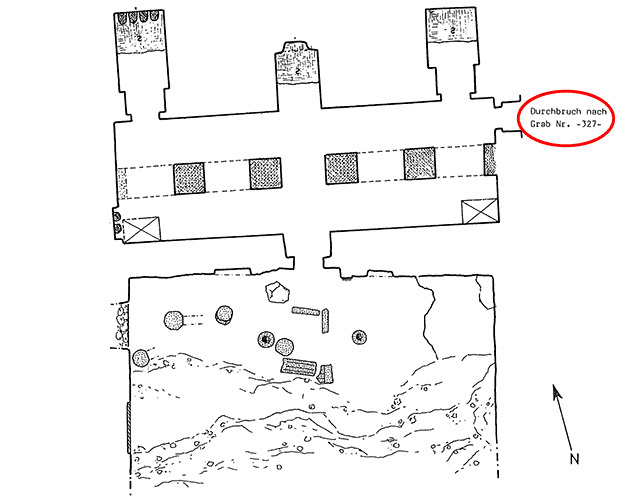 And in the 20th century there were some cursory efforts to map the main structure; however, Tomb Kampp -327, which you can see marked in red below, was never outlined. The newly identified Osiris complex includes a shaft that connects to multiple chambers that hold a number of interesting artifacts. One such area has a wall relief that shows a series of demons holding knives, which were placed there in order to protect the bodies of the dead. Another chamber (the central vaulted chapel) has an emerald skinned deity sitting and facing a staircase with a 29.5-foot (9-meter) shaft in it. The shaft connects to another room with a second shaft that goes down for 19.6 feet (6 meters) into two rooms. It’s a little bit like a maze, as you can see below. The exact date of this structure’s creation is not known; however, researchers believe the tomb complex dates back to the 25th dynasty (760 – 656 BC) or 26th dynasty (672 – 525 BC), based on a comparison to similar tombs that contain Osirian elements. 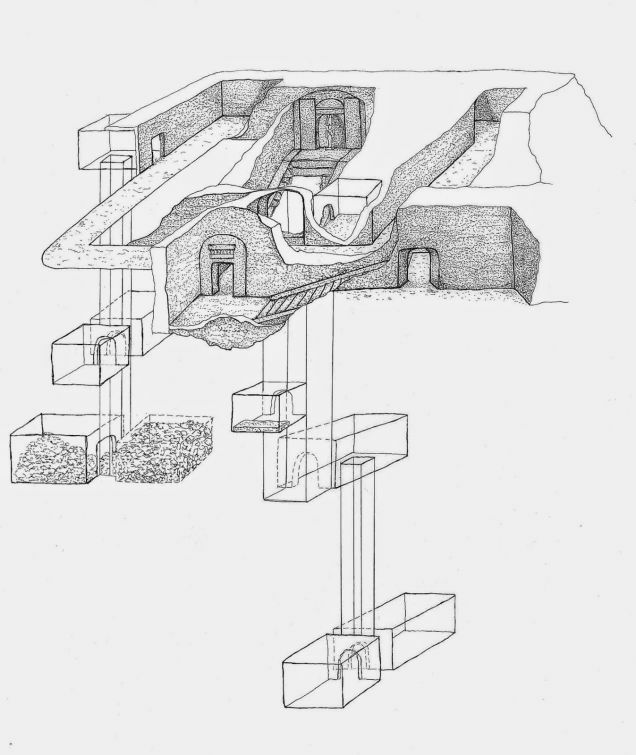 Drawing of the tomb’s architecture made by Raffaella Carrera, of the Min Project.